Carlton Cole and Scott Parker were on target to help West Ham to victory at Watford and make it back-to-back wins in the npower Championship. Sam Allardyce gave Cole his first start of the season and the striker, who is still expected to leave before the end of the month, grabbed his first goal since February. England midfielder Parker, another player whose future remains uncertain, put the seal on a convincing display late on. The unlikely figures of defenders James Tomkins and Joey O'Brien had put West Ham two up at half-time. The relegated Hammers won only two away games all last season, but they have matched that tally after just two road trips this term. They beat Doncaster with a fifth-minute goal on Saturday, and opened their account even earlier at Vicarage Road. Matt Taylor's free-kick was turned behind at full stretch by Hornets goalkeeper Scott Loach, and when Taylor swung in the corner Tomkins planted a firm header inside the far post after two minutes. Former Bolton midfielder Taylor was inches away from doubling the lead when he curled a free-kick over the wall and inches wide. But Watford looked dangerous themselves early on and Marvin Sordell's turn and shot forced a fine save from Hammers keeper Robert Green. Hornets skipper John Eustace then shot straight at Green from close range following a corner, and Chris Iwelumo put the rebound over the top. West Ham should have gone further ahead on the half hour when Mark Noble played Taylor's corner back across goal and centre-half Winston Reid, from all of three yards out, poked the ball wide. The visitors got stronger as the first half drew to a close strongly with Noble fizzing a cross narrowly out of the reach of Kevin Nolan, Jack Collison heading Parker's cross over and Loach denying Cole. And their pressure told in added time when O'Brien, another of Allardyce's ex-Bolton brigade, burst forward from the halfway line, reached the penalty area and drilled a low shot across Loach and into the far corner. Watford are still looking for their first win of the season, but there was no way back for the hosts after Cole tucked in number three in the 70th minute. Left-back Herita Illunga crossed and Cole was on hand to sweep the ball past Loach. Parker wrapped up the victory with a classy finish from 20 yards in stoppage time as the duo sent a timely reminder to one or two top-flight clubs with the transfer window closing in a fortnight. Watford Loach, Doyley, Taylor, Mariappa, Dickinson, Eustace, Yeates (Deeney 74), Forsyth, Jenkins, Iwelumo (Massey 56), Sordell. Subs Not Used: Gilmartin, Bennett, Mirfin. 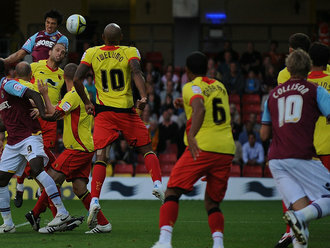 West Ham Green, O'Brien, Reid, Tomkins (Faye 67), Ilunga, Nolan, Parker, Collison (Faubert 75), Taylor, Noble, Cole (Piquionne 74). Subs Not Used: Boffin, Barrera. Goals: Tomkins 3, O'Brien 45, Cole 71, Parker 90.